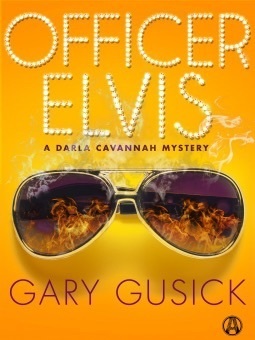 From Goodreads ~ After performing at a local old-folks home, off-duty police officer and part-time Elvis impersonator, Tommy Reylander, smoothes out his pompadour, climbs into his pink Caddy, and gets all shook up - fatally so, when a bomb explodes. Whether he was killed for his police work or bad singing is a mystery that detective Darla Cavannah is determined to solve. Though it’s been several years since Darla (reluctantly) partnered up with Tommy, she convinces her boss to let her lead the murder investigation. As the new regional director of the Mississippi Bureau of Investigation, Shelby Mitchell can think of better uses for his star detective’s time but not even the most hardened good ole boy can resist Darla’s smart, savvy persuasions. She soon embarks on a roller coaster ride through the world of Elvis tribute artists while tracking down one of the most bizarre serial killers in the history of the Magnolia State. Aiding her pursuit of the killer is recently reprimanded officer Rita Gibbons, fresh from the trailer park and described by Shelby as “half a licorice stick short in the manners department.” But Rita’s plenty smart, even when this case takes their suspicious minds in an entirely unexpected direction. Tommy was a police officer and part-time Elvis impersonator tribute artist. After playing a gig at a seniors' home, he gets in his caddy, which promptly blows up. Darla, his former partner, takes the lead on the murder investigation, which leads her to talk with a former drug dealer who now saves catfish, the owner of a strip bar, a poker-addicted lawyer and Tommy's girlfriend, Cill (she was "Priscilla" in his act). She eventually makes a link to other Elvis tribute artists as she tries to solve this murder. This is the second book I've read by this author and I liked it. I liked the writing style and thought it was well-paced. It's written in third person perspective with the focus on wherever the action is. It's an easy fun read ... you'll especially appreciate it if you are an Elvis fan. The language at times is for a mature reader. It is the second in the Darla Cavannah series, a Philadelphian transplant in Mississippi, but it works as a stand alone. You don't have to read the first one (I read it in 2013) to know what's going on as there's enough background given and this book happens a couple years later. I look forward to reading the next one in the series.